Dental implants are one of the restorative dentistry options which permanently replace missing teeth. They not only offer a permanent solution to tooth loss, they also answer problems such as bite pressure, irritation, and oral sores, as well as enhancing the aesthetic appearance of your smile. If you are missing teeth, call your Ria Family Dental dentist today! A missing tooth is more than just a hole in the mouth. It brings negative effects which only get worse the longer they are ignored. The loss of a tooth affects the performance of other teeth in their natural functions. The following are negative effects of missing tooth. Dental implant – titanium post surgically implanted into the jawbone to serve as the root of the tooth. 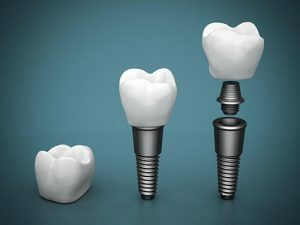 Abutment – Connects the dental implant to the replacement tooth. Dental crown – Tooth-coloured replacement tooth. Not everyone can get dental implants. Your trusted Ria Family Dental dentist will first conduct a comprehensive examination to determine if you are an ideal candidate. Dental implants are durable and can effectively participate in all your teeth’s natural functions. Pressure during eating is properly distributed creating stability in the mouth. Dental implants are a permanent tooth replacement option. With proper care, they can last a long time. With dental implants, the performance of all teeth is improved hence improving your overall oral health. Dental implants are made of materials with the look and feel of your natural teeth. Your jawbone receives the proper pressure for it to remain healthy, hence your cheeks do not sag. Talk to your Ria Family Dental dentist today to learn if you are an ideal candidate. Get the smile you’ve always deserved and say goodbye to missing teeth with durable dental implants.